There is news from (where else?) Texas regarding yet another kerfuffle over the “Confederate flag.” The State of Texas – like most States – raises a few extra bucks for its treasury and supports a few causes by making specialty license plates for certain universities, State agency initiatives, and organizations. There are about 400 (yes, four hundred) options, including high schools, clubs, fraternities, and even out-of-State universities, as well as slogans, advertisements, and proclamations of military status. Vehicle owners can, for a fee, get a plate with the name and emblem of their favorite cause. Except for the “Lost Cause.” It seems the State of Texas has determined that it would be “offensive” to allow the Sons of Confederate Veterans to join the American Quarter Horse Association, the Houston Livestock Show & Rodeo, Lubbock Christian School, Mighty Fine Burgers, Mothers Against Drunk Driving, RE/MAX real estate, and 29 different classifications of disabled veterans in having their emblem placed on a Texas license plate. What makes the proposed plate “offensive” in the eyes of the Texas Department of Motor Vehicles is that the emblem of the Sons of Confederate Veterans features at its center the battle flag of the Confederacy. The full emblem is shown in the upper left of the SCV website. 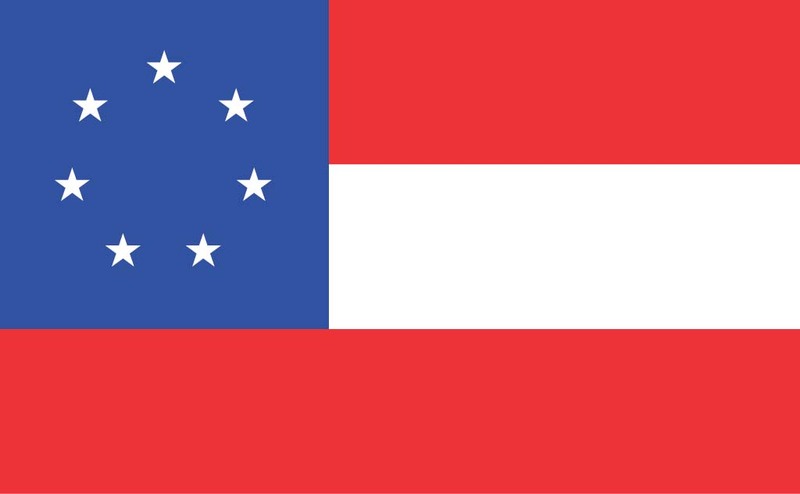 In 2014, the SCV filed suit to compel the DMV to allow their plate, in a case to be heard by the United States Supreme Court as Walker v. Texas Division, Sons of Confederate Veterans, Inc. At issue is whether the flag on the emblem is enough of a reminder to some of a history of racism and racial oppression to justify forbidding its display on a State-issued license plate. It is necessary at this point to digress from the specific free-speech issue of whether the plate should be issued. We need to get a bit of background on the disputed flag. I am impressed by the Associated Press article linked above (and again here) in that it identifies the flag for what it is: not the Confederate flag, but the Confederate battle ensign. In fact, the banner shown is neither of those. 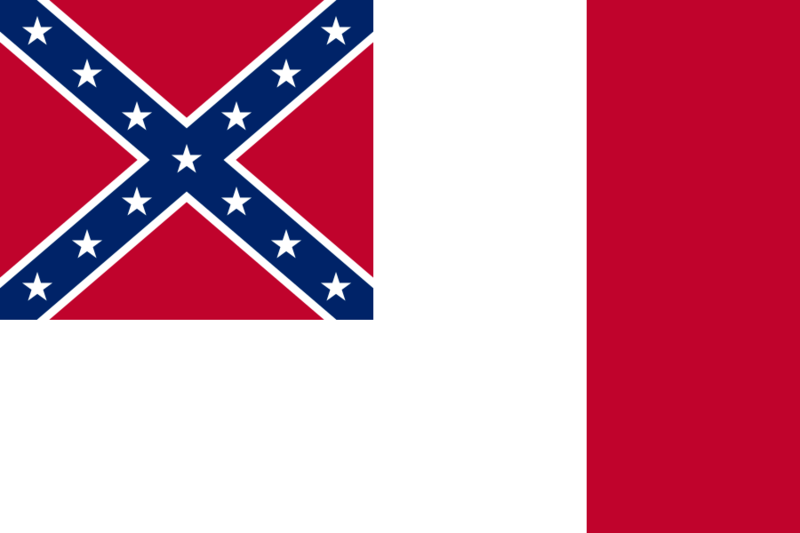 What is shown is the elongated version of the Confederate battle ensign, which is called “The Southern Cross.” The battle ensign itself is more or less square, and the elongated version was used as the Confederate Navy jack, flown on warships in battle. Here is the battle ensign as used by land armies. 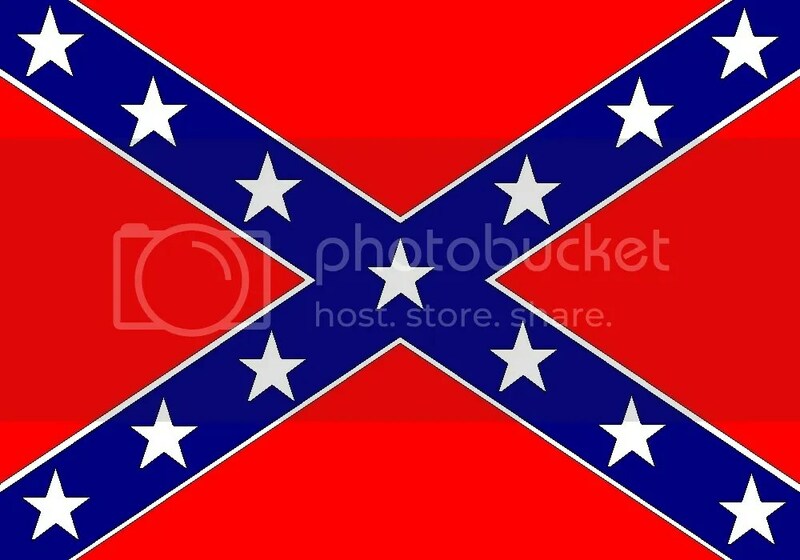 So, if the flag everybody argues about is neither “The Stars and Bars” nor the flag of the Confederacy, why is it the one everybody knows and is seen all over the country, while the true national flags of the Confederate States of America are virtually unknown? 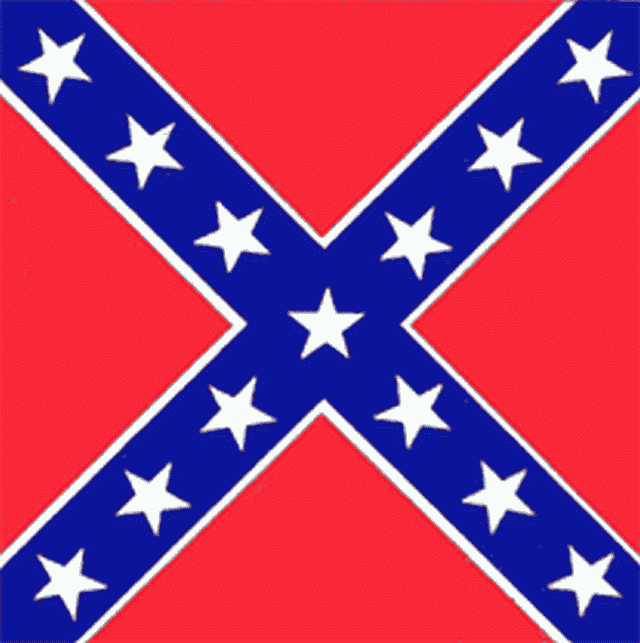 The commonly-seen “Southern Cross” is in fact the flag used in battle by the armies of (to Northern unionists and their sympathizers) the States in rebellion or (to Southern secessionists and their sympathizers) the independent nation of the CSA. So it is that when Southerners are asked to explain their attachment to what should be a symbol of rebellion and an unjust and oppressive social system, they will tell you it is not about rebellion, not about slavery, not about racism, but about heritage. Their heritage. I am constrained to ask, “What heritage? The heritage of slavery and rebellion? What heritage?” They tell African-Americans that slavery times ended long ago, so they should be over it by now. But is it not the descendants – literal and figurative – of the Old South who seem to be the ones who cannot let go of the past? With that historical baggage loaded, let us now return to Walker v. Texas SCV. At its heart, this is a First Amendment issue. As always, the question is, “Can the government restrict speech or expression simply because it is unpopular or because it might make someone else uncomfortable?” Normally, one would say that the government cannot restrict speech just because it is unpopular. The First Amendment was written to protect unpopular speech. Popular speech doesn’t need protection. As Justice Hugo Black pointed out decades ago, “The First Amendment says ‘Congress shall make no law abridging freedom of speech.’ It doesn’t say ‘some law. '” The Fourteenth Amendment explicitly extends these prohibitions to State governments as well. It will be interesting to see how Walker v. Texas SCV is decided. It has made some unlikely bedfellows in that representatives of both the extreme right and the extreme left of American sociopolitics have joined in support of the Sons of Confederate Veterans. The right decision, in my view, would be to allow the SCV to have its plate. With the plethora of license plate options that Texas has, expression should be nearly unfettered in a broad marketplace of ideas. Additionally, Americans of all political beliefs should take pride in a system that allows unpleasant, unpopular expression to be freely made. It carries on the tradition Jefferson evoked in his first inaugural address: “[E]rror of opinion may be tolerated where reason is left free to combat it” – a concept Jefferson expanded on in the second half of his second inaugural address. Previous Previous post: AND THE AWARD FOR BIGGEST WHINER GOES TO……..
Next Next post: MAY I HAVE YOUR NAME? I was never aware the “Confederate Flag” was just used in battle. My first thought when I realized that I didn’t know that was “How many people who have this flag hanging on their wall, as a sticker on their truck, or as a tattoo on their bicep know this isn’t the official flag of the Confederate States?” That being said, I don’t think it matters whether it’s the battle flag or the official flag because they’re both conveying the same image and ideology of the South pre (and post) Civil War. And I do agree with your view on this. It is almost a technicality, but that’s why I like living here I guess. Well-argued. Except for one point. The Battle Flag of the Army of Northern Virginia surpasses free expression of speech and enters treasonous speech and incitement against the American Constitution — indeed, that is what it represents. While I do not subscribe to pre-emptive sedition laws, I believe a known symbol of armed insurrection against the American government deserves no largesse from the system it would destroy. Speak of overthrowing the government as you will. Plot it, instigate it, pursue a war costly in blood and treasure for it, and represent it in a recognizable symbol, and you are traitors.